Thank you to Elizabeth Hulsen and the Community Council of the 94th Precinct for bringing together such a wonderful group of kids for a successful toy drive. This year, nearly 100 kids received toys, built gingerbread houses, decorated reindeer antlers, enjoyed snacks with Santa, and took photos in the booth. The COMPASS after-school program at PS 110 came for a visit to the set of one of our longest-running shows, "Blue Bloods." We would like to thank Katarzyna Selwesiuk (far right) for her dedication working with the kids this summer. This past Wednesday, Jane Raab produced our most moving scene of the season. At the offices of the Detectives' Endowment Association in Manhattan, Donnie Wahlberg and Will Estes awarded a check for $25,000 from "Blue Bloods," CBS, and Tony Argento to the families of slain NYPD officers Rafael Ramos and Wenjian Liu. With Detective Jim Nuciforo ably handling the logistics and NYPD Commissioner Bill Bratton graciously presiding, it was a memorable moment where our fictional world intersected in solidarity with their tragically real one. Thank you to the Detectives' Endowment Association and the NY Police Department for keeping us safe. "Blue Bloods," which films right here at Broadway Stages, is helping the nonprofit Rock And Wrap It Up! provide food to soup kitchens, churches, and homeless shelters across North America. Using green tactics, the organization collects untouched food from concerts, television production sets, and catering tables and distributes it to agencies that fight poverty. Since 1991, Rock And Wrap It Up! has donated to over 43,000 shelters and places of need and fed more than 500 million people. Read more at nylovesfilm and visit Rock And Wrap It up! Facebook to get involved. 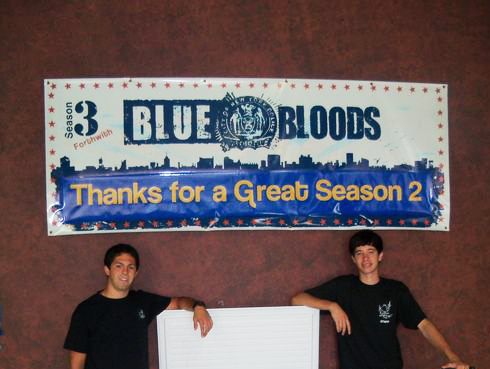 "Blue Bloods," filmed at Broadway Stages, is helping Rock And Wrap It Up! fight poverty.